SpaceX CRS-7 lifted off from Space Launch Complex 41 at Cape Canaveral Air Force Station at 10:21 a.m. EDT today, on the company’s seventh resupply mission to the International Space Station. At roughly 139 seconds after launch, the Falcon 9 rocket experienced an anomaly which resulted in the loss of the vehicle. Prior to launch, the SpaceX team was not tracking any issues. SpaceX will lead the accident investigation with support from NASA and oversight from the Federal Aviation Administration which issued the launch license. SpaceX will return to launching cargo to the space station as soon as it is safely possible. Initial data points to a potential issue with the second stage of the Falcon 9 rocket. The Expedition 44 crew aboard the station remain in good shape in terms of supplies with adequate levels until at least October even without the upcoming Progress launch. Significant vehicle and research hardware was lost, including the first of two International Docking Adapters, but NASA will work to replace these items on future cargo flights. There is no immediate impact to station operations. The next cargo launch to the space station is scheduled to take place at 12:55 a.m. Friday, July 3, with the Russian Progress 60P vehicle planned to deliver several tons of food and supplies to the station crew. Today’s events are not expected to impact the launch of the next station crew on July 22. For residents near the launch zone, if you spot debris in the water or see it washed up anywhere along the Eastern Florida shore report it to either NASA’s debris reporting hotline at 321-867-2121 or Patrick Air Force Base at 321-494-7001 or contact your nearest local law enforcement official. 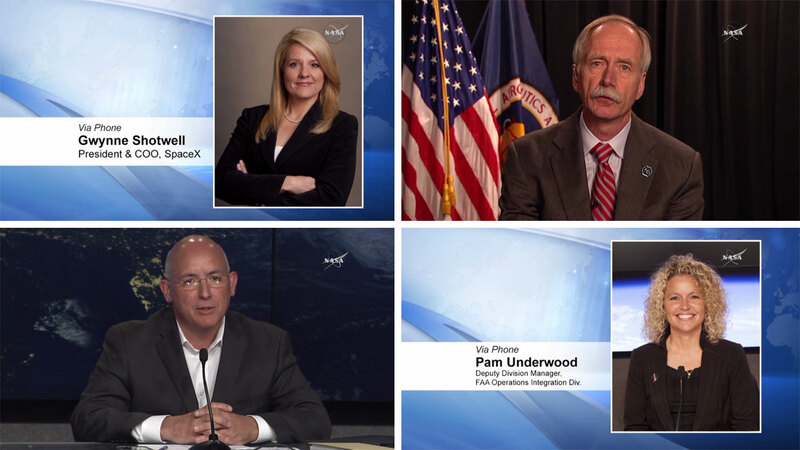 Managers from SpaceX, NASA and the FAA discussed the SpaceX rocket anomaly Sunday afternoon. Clockwise from top left: Gwynne Shotwell, President and Chief Operating Operating Officer, SpaceX; Bill Gerstenmaier, Associate Administrator for Human Exploration and Operations for NASA; Mike Suffredini, International Space Station Program Manager for NASA; Pam Underwood, Deputy Division Manager, FAA Operations Integration Division. I wish SpaceX all the best! Their Falcon 9 has demonstrated itself as a capable launch vehicle so I hope the issue is an easy fix. I applaud the opening of space launch and exploration to private companies. I hope resupply missions are only the begining. I know I’d certainly like to take that trip some day. While this is disappointing news, I’m optimistic Elon Musk and SpaceX team will bounce back on this…Kudos to the team for even daring to try. I hope consideration for unexpected situation to be accurate and safe for everything towards next stage! Although the rocket and mission failed we should go to the next step and continue and learn from this most unfortunate happening. Most unfortunate. But Falcon 9 has already proven to be a very capable booster. The important thing is that the powerful launch abort system recently demonstrated with Dragon V2, would have ensured the survival of a crew. Maybe it should also be fitted to Dragon cargo – this would meant the survival of the valuable pressurised cargo & its relaunch later. I agree with John Hackett.